This video shows a 1.1 -> 3.2 upgrade as being seamless, so 3.1 -> 3.3 is presumably no more difficult. Expect some template weirdness once I've upgraded. I've given the blog a little bit of a facelift today. I've wanted to do it for a while and never quite got around to doing it. Hopefully now it is a slightly cleaner interface, and the text isn't so small that it's difficult to read. There are still a few tweaks I need to make, but on the whole I'm happy with the new look for it. Despite the fact that somebody seems to have hacked into my server this evening and deleted all of my photos, I have been working on a way of mapping all of the photos I've uploaded to the website over the past few years. I had the idea of mapping them a while back but didn't progress further than showing roughly in the world a place is located. 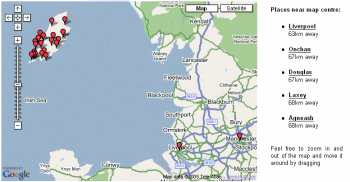 Recently, however, online mapping services have improved in leaps and bounds. As part of this, Google has just opened up their system for anyone to add their own data to as well. Tonight, this is what I have begun to do. Each of the towns and cities in my gallery has been 'geocoded' to a specific location and is now pinpointed on a map of the globe which you can click, drag and zoom to your hearts content. I am still experimenting with the opportunities here, but features you can expect from the site soon will hopefully include photos in the popup bubbles and maps on each town and city page to show nearest neighbours. Mapping travels would be something I'm interested in trying out as well. This is just a test to see how things go with this new software I am trying out, w.bloggar. So far it seems to work quite well, and it has even allowed me to upload this image to my server. I think I'll be trying this out a bit more over the coming days and weeks to see if it works well with MovableType, the software which I'm using to run this blog. Whilst I prepare the blog for launch, there will be some bits that do work, some that don't and some that are somewhere in between. So, if you have found your way in here whilst I'm still tinkering with it, please excuse the mess and I look forward to welcoming you back soon. Welcome to my new blog. I am considering starting up a blog, or web log, in addition to the news section of my main site. The news section will become more site-specific - the way it's been going for a while - but this blog will contain other bits and pieces that I find interesting, probably mostly in the world of photography, web design and development and geographic information. The blog will go live soon hopefully, at which point I will announce it in the news section and link it from the rest of the site.